Rialto is leaving the Overwatch PTR. 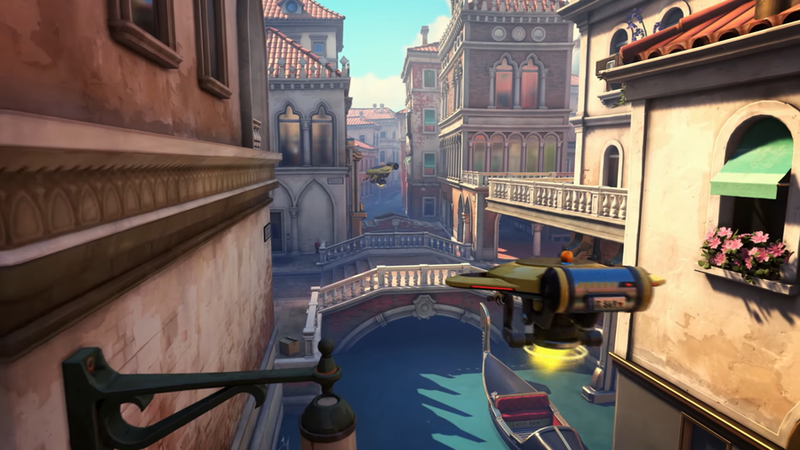 On May 3, Overwatch players will be able to roam the streets of Venice, Italy. Overwatch’s new payload map Rialto will be added to the game’s live server this week, according to Blizzard. The new map has been in testing on the Overwatch test server since April 19—though a slightly different version has been playable during the Overwatch Archives event, which ended yesterday. The map will be playable on PC, PlayStation 4, and Xbox One Overwatch players. It’ll stay out of the Competitive Play map pool “until a future patch,” Blizzard said. Until then, it’s only accessible in the Arcade, Quick Play, and in custom games. Blizzard did not mention an exact timeline for Rialto’s addition into the Competitive Play map pool. Rialto was initially introduced to Overwatch players as part of the Overwatch Retribution co-op brawl. The playable mission sent a squad of four Blackwatch heroes to the streets of Venice to take out a Talon bad guy. The brawl used a nighttime version of the Rialto map, while the new payload iteration uses a daylight variation. The backdrop should also be familiar to players who remember the Doomfist Masquerade comic, which is set at the Talon headquarters. Season 10 of Overwatch‘s Competitive Play queue is live now—it started yesterday. Overwatch players will have a few months to climb the ladder and prove their skill against others. In addition to Rialto, new Overwatch hero Brigitte has also become available for Overwatch players in season 10.